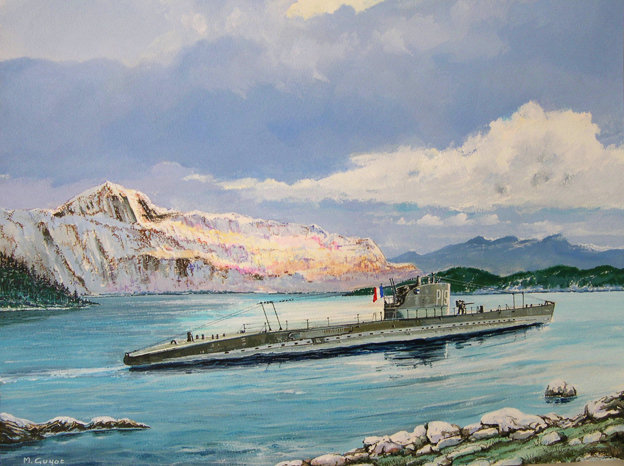 JUNON was a Minerve-class sub in the French Navy. She was transferred to the "Forces Navales Françaises Libres" after the French surrender. She participated in Operation Musketoon during September 1942. This particular Free French Navy submarine was chosen for this specific task as her silhouette was similar to that of a German U-boat which would help disguise her if spotted on the surface. Junon, under the command of Commander Querville and escorted by the British submarines HMS Sturgeon, Trigris and Thunderbolt, successfully transported the Anglo-Norvegian Commando team to Glomfjord in Norway where the German-controlled power plant was destroyed. This plant supplied electricity to a nearby aluminium factory as well as the local community. Have you seen SubArt's other painting of Junon? This painting is priced in EUROS. For on-line purchasing click on the PayPal logo next to desired item.